Winter was once considered an off season for weddings. Only a few daring or desperate brides would choose the colder months for their nuptials. And somehow these winter weddings of yesteryear tended toward a Christmas-y theme. But no longer. Winter weddings are emerging as equal to their June counterparts. And no red velvet and poinsettias need be included (unless your dream wedding is made of red velvet and poinsettias of course – in that case – the more, the merrier!). For modern couples can be the ideal wedding season for any number of reasons. It’s just an added bonus that a few venues still offer discounts for cold-weather events. These days winter weddings can take on any color scheme they like – blush and maroon, pale blues, classic green and ivory – don’t feel bound by tradition. Likewise, choose the décor and venue that suit your personality – no need to abide by holly and candlelight at dusk if you prefer cocktails near a firepit, or an afternoon ceremony followed by lunch at a brewery. Likewise, imagine broader possibilities for your wedding photos. 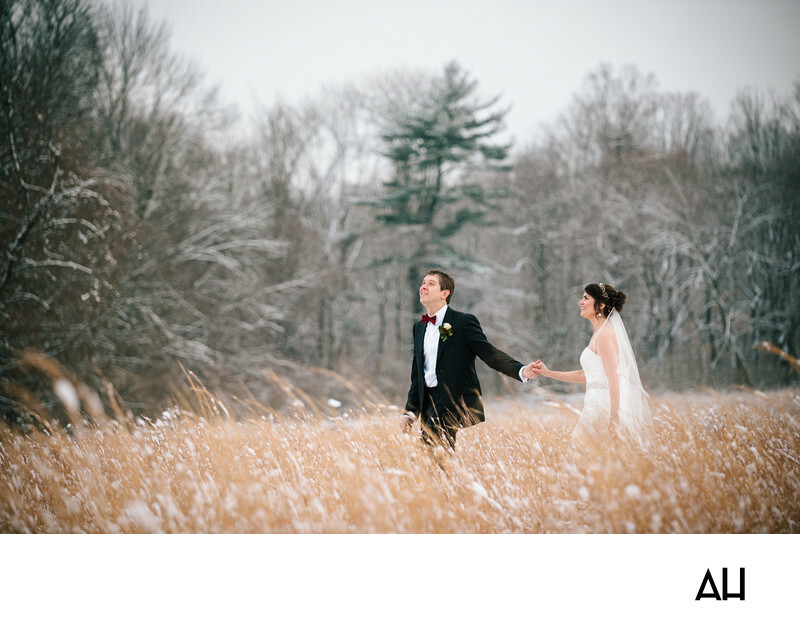 Far from bleak, I capture stunning wedding photos in the winter months. Not only does the crisp, cool air lend a certain art to the photos, but there is surprising color to be found. You just have to have the eye to find it. You might assume natural foliage is non-existent in the winter. But this photo shows that there can actually still be plenty of color in nature – even after a snowfall. In fact, I often find that nature lends my photos a more sophisticated palette than the rest of the year. If having beautiful outdoor wedding photos is a concern, send me a note and we can chat more – I have a thousand ways of capturing your winter wedding that will leave you and your partner with a beautiful set of memories.